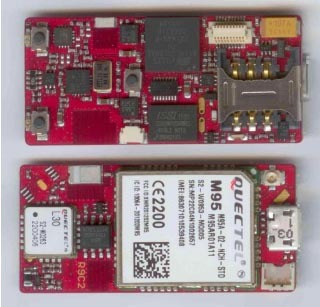 KCS bv, based in Dordrecht, The Netherlands, has introduced the newest OEM addition to its family of TraceME products, the TM-202LAR, a GPS/RF/GSM module intended for incorporation into products and systems used for tracking people, vehicles, and objects. Measuring 46x21x6.5 millimeters and weighing seven grams, the low-power TM-202LAR incorporates a 48-channel CSR SiRFstar-IV GSD4e GPS L1 receiver, GPRS/GSM modem (QUAD band version) for RF connectivity up to two kilometers (1.2 miles), and a 3D magnetic compass and 3D accelerometer the operates at up to 16g. The 2.45 GHz short range radio and optional Wi-Fi extension enable localization inside buildings. With typical power consumption at 30 mA for full GPS tracking and GPRS operation, the module’s advanced power-saving operation lowers power consumption down to 3μA, according to the company.